This section is perhaps our favorite on the site, past, present and future. 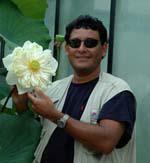 Here we join with water gardening friends from around the world to offer a wide variety of information and images from many different points of view and locales. The people represented here are uniquely talented and interesting individuals, writers, photographers, artists, hybridizers, collectors, scientists and just plain pond nuts, all with the common bond of a love for water gardening, a desire to learn and a desire to share knowledge. We invite contributions and suggestions for "more than links". The presentation is as varied as the people involved but we begin each one's pages with a profile of them. Then we will link to their articles, photos and web sites. We hope you enjoy our friends as much as we do!